The Fellowship was fortunate enough to obtain a copy of PATHFINDER #1 from Dynamite Entertainment. Jim Zub writes, and Andrew Huerta draws. A group of Varisia’s adventurers have stumbled across a bit of a goblin problem near the city of Sandpoint. Not only are these goblins attacking in the daytime, they also appear to be infected by something rather nasty. So when the team finds a large concentration of the foul creatures, quick action is needed. Will our heroes measure up to the challenge? The first thing I noticed in this issue is its pacing; this book is non-stop action and movement. It uses some of that action in introducing characters (which is essential in a first issue), but it does so in a way that doesn’t slow the manic pace. It uses combat banter to characterize (and a tavern brawl, too), and very nice art to keep the action flowing (including just a little gore). Overall I think this is a solid introduction to what should be a thrill ride of a title. Fantasy roleplaying games now have yet another very good comic adaptation here. As a fan of both, I’m excited about this title. 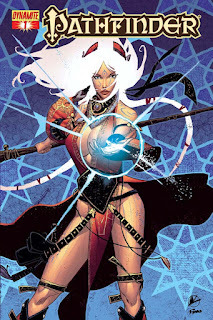 PATHFINDER #1 is available now at your FLCS or by order from dynamite.net.